Lori Vanbeek had a career-best 21 kills to lead the Youngstown State volleyball team to a hard-fought four-set victory over Eastern Kentucky on Friday afternoon in the first match of the Akron Invitational. The set scores were 25-19, 20-25, 25-18, 36-34. Vanbeek's 21 kills came on just 30 attempts, and the senior from Paw Paw, Ill., had just three errors for a .600 attack percentage. She added nine blocks as the Penguins topped the Colonels for the first time in program history. Sarah Varcolla finished with a season-best 13 kills, and Val Jeffery had 16 digs to go along with her 47 assists. Celina Sanks had a match-best 24 kills for Eastern Kentucky. Vanbeek had six kills in the opening set as the Penguins hit .294 and never trailed in their 25-19 victory. EKU hit .325 in the second set, up from .111 in the first, to win the second set 25-20. In the third set, Youngstown State did not have an attack error in 25 swings, finishing with 15 kills and a .600 attack percentage. Vanbeek had five kills in the set, and the Penguins trailed just once at 3-2. While there were nine ties and three lead changes in the first three sets combined, there were 21 ties and nine lead changes in the fourth set. At 36-34, it is the longest set YSU has played in since sets were shortened to 25 points in 2008. Eastern Kentucky led by four on four different occasions, the last time coming at 21-17, before YSU rallied. Youngstown State scored the next four points to tie the score at 21-21 and eventually took a 23-22 lead on a Paige Saunders kill. 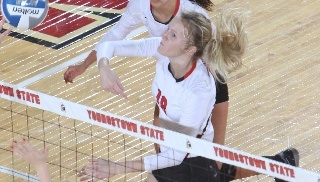 YSU had its first of nine match points at 24-23, and the Penguins fought off three set points before prevailing. A Vanbeek kill made the score 35-34, and Sam Brown finished the match with her seventh kill. Youngstown State will play a pair of matches tomorrow at the Akron Invitational. The Penguins will play Canisius at 10 a.m., and they'll play the host Zips at 7 p.m.